The Tutor/Mentor Leadership and Networking Conferences were started in 1994 as a way to bring together the different organizations who responded to a survey launched in January 1994 to identify as many organizations as possible who were offering various forms of volunteer-based tutoring and/or mentoring. It was also part of a strategy intended to draw greater media attention to tutoring/mentoring, and as a result, draw volunteers and donors to the various programs in Chicago. 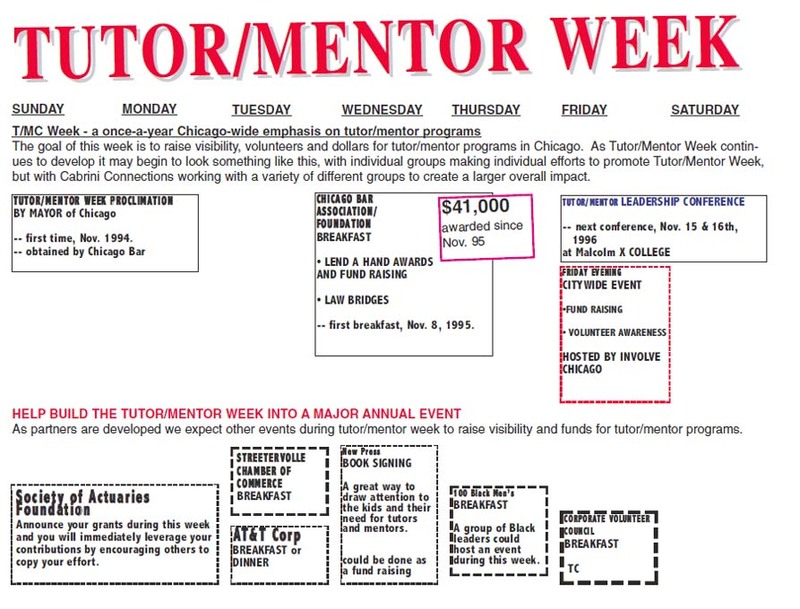 One strategy deployed during the 1990s was a Tutor/Mentor Week which was the week each year when the Tutor/Mentor Conference was held and when the Chicago Bar Foundation/Association's Lend-A-Hand Program held a fund raising event. The Mayor issued a proclamation supporting this collective effort and the goal was that organizations in different neighborhoods would hold their own events recognizing programs in their neighborhoods. Companies could do the same in recognizing employee volunteers. 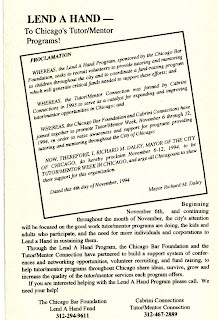 This strategy was discontinued in late 1999 as the Lend A Hand moved to a different structure and strategy and the T/MC ability to attract revenue declined. However, as part of the overall Tutor/Mentor Institute, LLC strategy, this is an idea I hope to rebuild. e) the visibility of Tutor/Mentor Week also builds participation in the Tutor/Mentor Conference and can attract additional sponsors who will provide dollars for the conference and for annual-operation of the Tutor/Mentor Institute. Copy of front page of the Daily Law Bulletin, illustrating the media coverage the events and Tutor/Mentor Week were generating. See these images in this blog article. The Tutor/Mentor Connection did not have enough people on its board with the civic reach needed to attract philanthropic investment in this strategy so too few dollars were available to develop it. At the same time the structure and leadership at the Lend A Hand Program changes and new leaders had less history and commitment to the original partnership goals that brought the two organizations together. Finally, too few leaders still see their role as an intermediary and too few invest in the year-round marketing needed to help an entire social sector grow in a geographic area. Through the renewed Tutor/Mentor Institute we will continue to battle to overcome these challenges.